As my plane landed in Austin at 11:43 pm after sitting on the Dallas runway for nearly four hours, I noticed the stiffness settling in my body and the weight in my eyes. Despite the life of the weary traveler wearing on me, I was eagerly anticipating the morning. An old friend with access to thousands of acres of ranch land in Texas had contacted me, offering me an opportunity to come down and take care of some wild hogs… offering me a winning lottery ticket would have evoked similar feelings. I grabbed my carry-on bag, a wicked night light set up for my bow, and proceeded to the baggage claim to gather up my bow and my .270 rifle. As I watched the last bag disappear from the luggage escalator, I began to get nervous. I approached the airlines customer service to inquire about my missing “bags”, and they proceeded to tell me that they didn’t have them, and that they must have been left in Dallas. Panic set in alongside the sleep deprived delirium as I began to rack my brain for an alternative for my hunt. I happened to glance down behind the counter and noticed my bow and rifle sitting there, safely in their cases. “That’s a rifle sweetheart…” the attendant responded sweetly, boasting a thick southern accent. Relieved and too tired to address it any further, I thanked her, grabbed my gear and headed for the motel. My phone buzzed loudly at 4 am, bringing me out of my 3 hour power nap. I grabbed my gear, and headed north out of Llano towards the ranch. The thick brush and winding dirt roads reminded me of an article I read about hunting the bush in Africa. My excitement began to take over my fatigue as I drove past the cattle gates to my first spot to hunt; a small stand nestled in a giant cottonwood. I reached the stand and nocked my first arrow as the woods began to come alive. I’ll never forget hearing my first hog squeal in the distance, and the rustling in the brush just behind my stand. However, they never made an appearance. Mid-afternoon, I left the stand to explore a little. The ranch seemed to be a desolate, endless collection of trees and shrubs and cactus. I managed to kick up a nice 5×5 whitetail and a few coyotes while scouting the property, before making my way to another stand I stumbled across for the evening hunt. I saw my first hog as the sun began to make its descent beneath the horizon. Out of the corner of my eye, I caught the movement and carefully turned to the shooting lane through the branches behind me. A few sows were rummaging through the dirt just 20 yards down. I slowly drew and rested my knuckles against my cheek as I pulled my first pin up to the kill spot, and let my arrow fly… THUD. The hog squealed and took off into the brush. 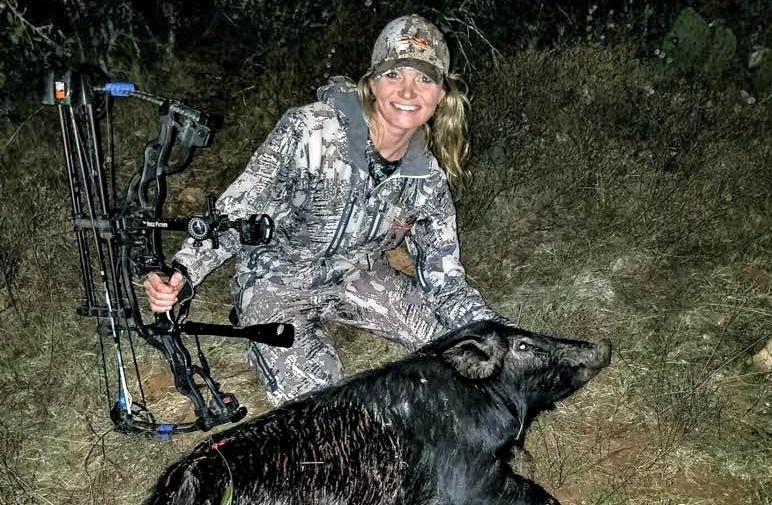 Heart racing, I knocked another arrow and a few seconds later, took my second shot at a bigger boar that came in at a brisk pace followed by a few sows and some piglets. Darkness had claimed the woods as I carefully climbed down the tree. The brush was so thick that I decided to wait until the morning to track the hogs. The next and final day of my hunt was filled with action, small town Texas BBQ, and wildlife. I snuck up on a few unsuspecting toms in full strut, countless whitetail and I managed to shoot 3 more hogs. As I was cleaning my last hog, I sat back on my heels and gave thanks for the harvest, another weekend in the wilderness, and the chance to disconnect from society for a few days. Its simple moments such as this that remind me how grateful I am to be a hunter with a real connection and appreciation for the wild. I’ve found the easiest, and tastiest way to season the hog is with salt and pepper, brown sugar and some cayenne pepper for that “sweet heat” flavor. Rub it in and refrigerate for 2-4 hours. I’ve read its best to liberally apply the seasoning to all the cracks in the shoulder, and tie the shoulders to help hold and support the meat. After the meat reaches that temp, removed and add your favorite BBQ. I bought a few containers of BBQ from a small town BBQ joint in Texas that I loved. Let the meat cool down before shredding with tongs, and load it up on a soft bun, add some coleslaw for texture and enjoy! What a great story! Glad your hunt was successful. I am sure it more than made up for the travel delays and inconvenience. I can’t wait to try your recipe…so easy!